When I was growing up, my brother, sister, and I had a chore rotation. Every week, we had to clean one toilet, vacuum a few rooms, dust one room, clean several windows, and mow the grass. A little bit of everything. As I look back, I think it was a flawed system. Because now I know that not all chores are equal: Different people enjoy different chores. For example, I’ve realized that I rather enjoy the sense of accomplishment of vacuuming a carpet, especially as a cat owner. Within about 5 minutes, a carpet can go from looking like–well, like a large, long-haired cat–to a pristine environment for pushups and game nights. Conversely, I don’t think I’ve ever cleaned a window in my condo (I’ve owned it for over 10 years). Mirrors, yes. They’re solid, so you can see the results of your work right away. That’s not the case with windows. I’ve had a Roomba for a few years that I’ve used alternately with a cheap upright vacuum cleaner. The Roomba picks up the superficial stuff, but doesn’t quite do the job for friends who are allergic to cats. Unfortunately, the cheap vacuum stopped working last week. 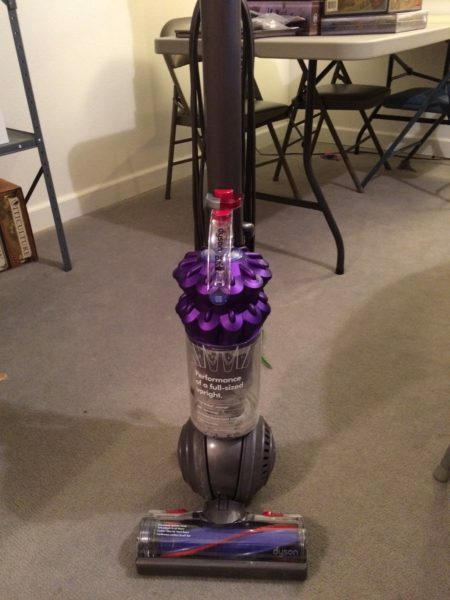 So I decided to indulge my carpet-cleaning desires, and I got a Dyson. You can see him pictured here. I’ve heard great things about Dysons, but I still had my doubt that it could be all that different than any other vacuum. The results of the first vacuum were dramatic, though–Dyson picked up at least twice as much dirt and hair than my previous vacuum ever had. And it’s much quieter than I thought. And the rotating part wasn’t instantly clogged with hair because of the way the bristles are positioned. You might be cringing as you read this because you hate vacuuming. But I bet there’s a chore you actually find some pleasure in. What is it for you? This entry was posted on Thursday, April 14th, 2016 at 9:22 pm	and is filed under confessions and tagged with confessions. You can follow any responses to this entry through the RSS 2.0 feed. My wife and I split the chores. I vacuum, take out the trash and recycling, do the grocery shopping, and walk the dogs at night (and currently in the weekday afternoons since I’m “a full time game designer” i.e. unemployed). She cleans the bathroom, does most of the laundry (though i tend to do a load or two every weekend), walks the dogs in the morning and weekend afternoons, and gets our son ready for school. We split the cooking and dishes pretty evenly, as well as taking turns on our son’s nightly bedtime routine. Vacuuming is my least dreaded chore. I agree with your observation that it’s easy to see your accomplishment when finished. We bought a Dyson a few years ago, it has been amazing. I also don’t mind doing the dishes, but I hate HAVING to do the dishes, if that makes sense. It does provide a nice few minutes where I can put in my headphones and listen to a podcast. It also has that very visible completion aspect (and occasionally becomes a stacking dexterity game). I have somehow gotten out of having to clean the bathroom for the last 18 years. Still not sure how I managed that one. 18 years of not having to clean the bathroom is a significant accomplishment! Well done. 🙂 I’m glad you and your wife worked out a system that works for both of you. I’m so happy that you got yourself such an awesome vacuum cleaner! I think I like doing laundry. Nothing is more awesome than fresh warm laundry and clean bed sheets. Smell so nice like warm spring air. 🙂 Doing dishes are the worst! Dyson for the win! And they last forever! My $429 Animal from 2003 still works fine. That’s an environmental win against a $150 Hoover every 2 years! I love cooking. I love doing laundry, though not because of the smell, we are a scent free household as much as possible. I don’t mind cleaning bathrooms. Unless I am the only one living in a place, I do not take out trash or recycling. I hate doing it, and as the primary breadwinner who does 75% of the chores in a four person household, I put my foot down right there. First of all, it’s laundry for me. I love me some laundry. Admittedly, I feel that sense of accomplishment when I clean out the dryer lint trap; it feels like I’m getting a sense for how much cleaner the clothes are now than they were. Also, I think you may have convinced me to buy a Dyson. I want one RIGHT NOW! As a side note, I can recall my younger self shopping for a vacuum and thinking, “$500! I could almost buy a car for that amount”…then buying the crappy $75 vacuum that never works. Trev: Yeah, I had a similar train of thought when I bought my cheap vacuum a while ago. And it did last a while–I got my money’s worth (though I’m glad Dysons last a long time–Julia, it’s amazing you’ve had yours for 13 years!). I’m actually excited to use the Dyson again, kind of like what you said about cleaning out the lint trap. I’m late to the party on the blog posts as usual, but I really enjoy cleaning toilets, sinks, and bathtubs/showers. I love the cold, slick surfaces, the shine rewarding me for a job well done, and the smell of sanitized cleanliness. The bathtub gives me a light squeaking sound to tell me he’s fresh and germ free and it’s perfection to my ears. I’m definitely bathroom kind of gal. I can’t stand vacuuming, it’s so frustrating and when I run over things the smell of something burning permeates the house. If I wanted that smell, I would go into the kitchen and try to cook. No thanks on vacuuming.